A bit warm but overall very nice. Â It was in the mid-80s when we arrived at the park around 5pm, but the sites are quite shaded, so it was pretty comfortable. Â The evening was perfect: in the 60s. Â We were all wearing jeans and T-shirts with no trouble. Â Overnight low inside our tent was 62F; it was probably a few degrees cooler outside. * So far, all of the Santa Clara County Parks I’ve camped at have been clean, quiet, and not overcrowded. Â Uvas definitely fits that description. Â Everything was very well-maintained (the maintenance crew drove by three times in the morning, collecting trash, cleaning the restrooms, etc). * The campsites are very close together. There is good canopy cover from the sun, but very little privacy between campsites. * Each site has a fire pit, concrete parking pad, food locker, and picnic table. There are garbage cans and recycling bins at the restrooms and spread around the camping areas, plus water spigots about every third campsite. * The bathrooms are clean well-stocked.Â The bathroom building nearest our site had separate men’s and women’s stalls with flush toilets, sinks, and mirrors. No soap, but there was an air hand dryer (no paper towels). Â The bathroom nearest our site did not have showers; I didn’t look to see if there were some elsewhere. * The campground has a wood fire ban during the summer (mid-May through late October): charcoal fires only. Â Occasionally there are fire bans altogether and only camp stoves are permitted — check before you go. Â I didn’t see anywhere to buy charcoal (or wood) at the campground. 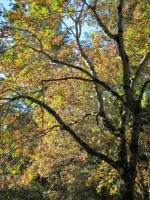 Outdoor enthusiasts will find Uvas Canyon Park has much to offer. The park hasÂ six miles of hiking trails including a one mile Waterfall Loop that travels along Swanson Creek past many of the park’s waterfalls. Park visitors may also want to visit nearby Uvas and Chesbro Reservoirs. These reservoirs are open for non-power boating (electric motors permitted) and fishing. No swimming is permitted in any of the Santa Clara County Parks. These little bugs were everywhere. Â I think we brought a few hundred of them home, too. Who knew you could see this many stars within the Bay Area?